With this careful and appreciative presentation of a startlingly dramatic episode from Statius' too often neglected epic, the Thebaid, Patrick Yaggy has provided teachers a rich and unparalleled resource for classes on Roman epic or Latin poetry in general. 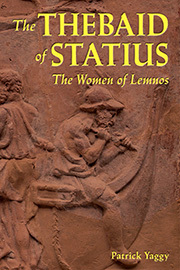 Designed first to provide students intelligent and intelligible access to the tragic tale of Hypsipyle and her fellow women of Lemnos, their mad slaughter of their husbands and all men on the island, and their subsequent encounter with Jason and the Argonauts, the book at the same time provides commentary and discussion questions aimed at helping readers see and interpret the story's many important connections to Vergil's Aeneid. The book's ample introductory material, comprehensive facing notes, glossary of poetic and rhetorical devices, and full Latin-English vocabulary make it ideal for advanced high-school classes, including AP® or pre-AP® classes, as well as for intermediate or advanced college courses. Yaggy has provided a laudable service to Latinists, their students, and even, one might say, to Statius himself, interest in whose storytelling and poetic artistry will certainly be further stimulated by this finely crafted textbook.